Whether you are an audiophile or working in an office that requires constant communication with your clients, chances are; you need a reliable headphone with a built-in mic. While there are several options to choose from in the market, not all of them are created equally. More often than not, you may encounter or use a headphone with subpar build quality, and worse, a muffled mic. If you are on the lookout for an excellent and reliable headphone that lets you do your work and enjoy your music without any hassle, you are in the right place. In this article, we will feature a list of the best headphones with a mic. These products offer excellent sound quality while also not skimping out on the audio output from the microphone. What are the Best Headphones with a Microphone in 2018? There are several headphones with mic that abound the market nowadays. However, you should veer away from cheap headphones. This is not to say that all headphones from the budget segment are worthless, but most of these cash grabbing headphones belong in the aforementioned price segment. The first entry on our list is from the ever-popular brand when it comes to audio devices and components, Bose. In this case, we considered the Bose QuietComfort 35 as one of the best headphones with the mic on the market right now. The Bose QuietComfort 35 is made of a sturdy plastic body while also donning metal speaker plates and arms. This build quality helps the headphone plow through external stresses and survive constant wear and tear. Having comfort as part of its name, it surely delivered in this department. The headphone comes with comfortable over-ear earplugs that provide comfort even with long usage. Equipped with its own active noise canceling technology, the Bose QuietComfort 35 conceals noise to provide a more holistic and crisp audio output from the mic. The headphone also makes use of noise rejecting dual microphones for call making. As a result, the audio output is loud and enough and crisp without all the unnecessary hiss and annoying background noise. Moreover, the QuietComfort 35 also features mic monitoring which lets you feed some of your voice back to you so that you can adjust your volume to the most appropriate level. Other features included in the package are Bluetooth connectivity and Auto off feature. Our only gripe with this headphone is the fact that the battery cannot be replaced. 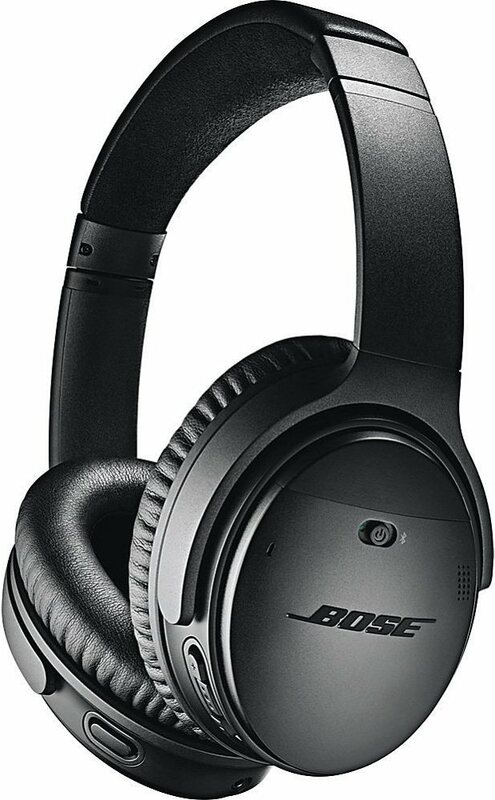 Making another entry on our list, Bose once again proves why it’s one of the best companies when it comes to headphones. IN our list, we will feature the older Bose QuietComfort 25. While its newly released sibling, the QuietComfort 35 is equipped with excellent specifications, the QuietComfort 25 also has its own set of advantages. As expected, the product has its effective Active Noise Cancellation feature which helps execute unparalleled audio output without all the unnecessary hiss and noise. Unlike its newly released sibling, the ANC featured can be turned off with a single click of the button located at the right portion. Moreover, unlike the QuietComfort 35, the battery can be replaced. Simply put in 3 AAA batteries whenever they die out. Some people prefer this over the built-in battery which cannot be replaced once damaged. When it comes to sound quality, the Bose QC 25 ultimately delivers providing a lively and crisp output across all frequencies. However, do note that the mic does not work directly on the PC port. With this, you need to make use of a headset splitter to make this possible. The next entry on our list is the gorgeous looking V-MODA Crossfade M 100. In a sea of mundane looking headphones in the market, the V-Moda Crossfade M-100 stands out due to its sleek and elegant look. Along with this elegant design is a slew of good specifications. 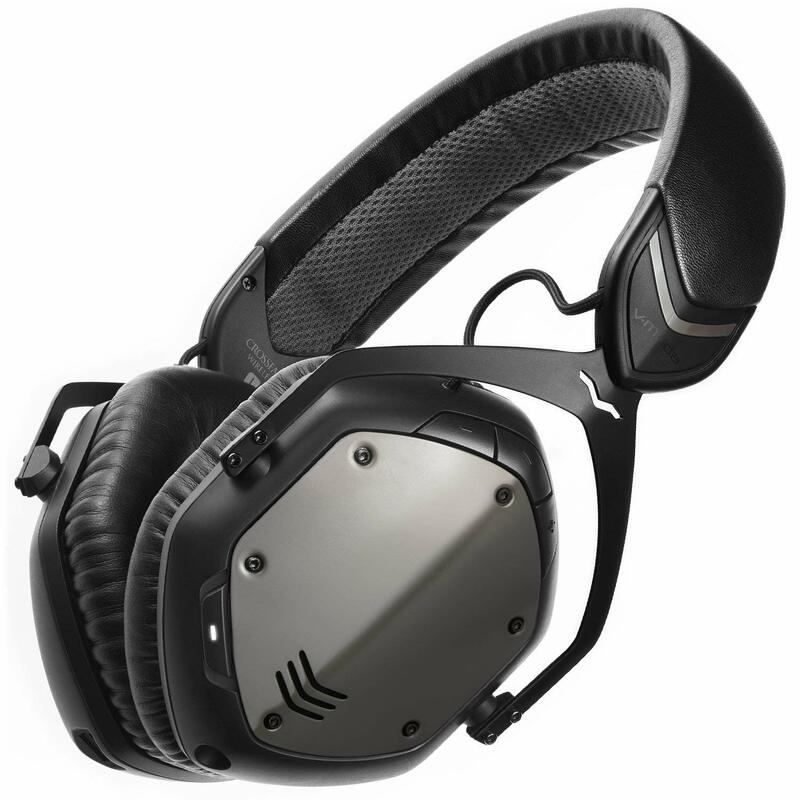 The V MODA Crossfade M-100 is made with high-quality plastic. The headphone flaunts large hexagonal earpieces, a look which is rare for most headphones. The earpieces extend into the padded Steeflex headband which provides comfort even with prolonged use. Moreover, the speaker plates can be detached and can be redesigned with your own customized logo. The headphones also come with two detachable Kevlar-reinforced cables. These cables can endure extreme stress and wear and tear. One of the cables is composed of a 3 feet SpeakEasy cable which is compatible with most smartphones or gadgets that has a 3.5 mm port. The other cable is a Shareplay cable which works as a daisy chain two headphones or can be connected with an external mic. The built-in mic produces excellent audio output that is well detailed, crisp and with just the right amount of bass. The microphone is also tailor-made for better speech recognition. However, active noise cancellation with the mic is just average compared to the others on this list. 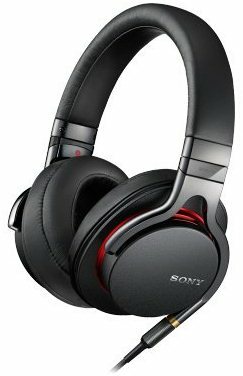 The next entry on our list is the Sony MDR1A Stereo Headphones. Sony has paved its way into almost every aspect of technology in today’s market. With their lineup of headphones, they excel in providing good build quality and exceptional audio output. For years, their headphones have been well known for providing a balance of refinement and restive audio. Because of this, their headphones are a favorite pick for audiophiles across the globe. With this, the Sony MDR1A is another contribution to its array of excellent headphones. One of the best selling points of the Sony MDR1A is the comfort it provides. The MDR1a is perhaps Sony’s most comfortable headphone to date. In terms of design, they revamped the once rounded ear cups and turned it into race track oval shaped ones. The earcups also don a plush padding that sits comfortably over your ears. They are also very lightweight, even more, lightweight than the compact V Moda M100 with a difference of 8 ounces. As a result, the headphones look slim and sleek when used. To add more icing to the cake, Sony made use of metal highlights on the earcups for added aesthetic appeal. More on the comfort department, the earcups of the sit conveniently over your ears and adapts to the shape of your head. Because of this, passive noise cancellation is made possible. Another worth noting feature of the MDR1A is its detachable cable. The package comes with two cables. One of which is a traditional OFC cable and the other one is equipped with an in-line microphone and remote. As of the moment, the controls are more customized for Android users and no word yet from the company, if they will update it to accommodate iOs users. The passive noise cancellation of the in-line mic of the cord is not as efficient as the ones seen in other headphones that make use of active noise cancellation. In our test, we still heard some background noise while playing songs. To compensate with the average microphone performance, Sony has set their eyes on providing an exceptional audio experience. The MDR1A is considered to be a high-resolution headphone. With this, you can expect booming bass output, smoother mids and crisp highs. In our test, the headphone lives up to its promise providing audiophiles an excellent listening experience. Closing the list with a loud bang is the Sennheiser Momentum 2.0 Wireless. For years, Sennheiser has been a favorite for audiophiles across the globe. 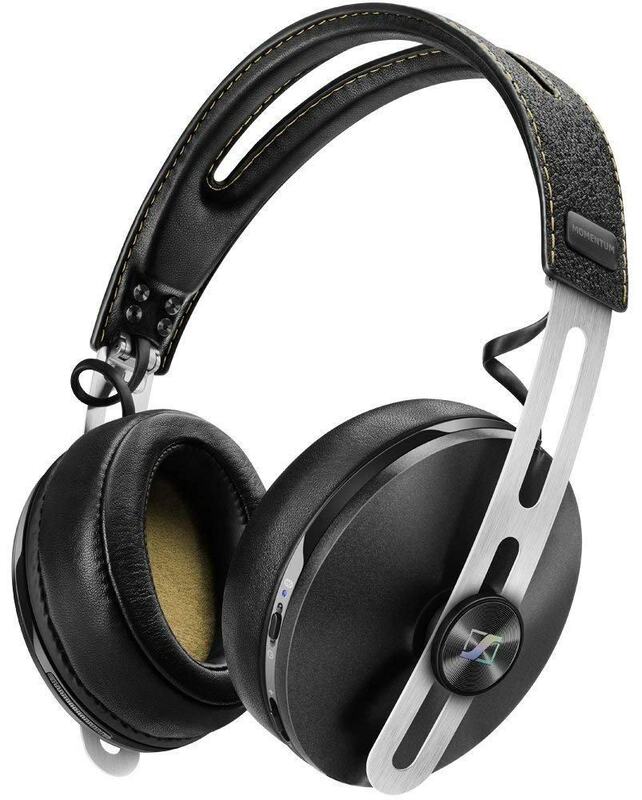 With the release of Sennheiser Momentum 2.0, they have generated quite a stir in the headphone market thanks to its excellent features and good build quality which are to be expected from Sennheiser. The Momentum 2.0 carries over the same DNA that consumers loved from its predecessors. Along with this, Sennheiser added in some upgrades that enhanced the overall listening experience of the headphone. The Momentum 2.0 dons a ground-breaking design flaunting despite the thin headband. The product boasts supreme comfort, which surpasses its predecessor. The product is given more comfort value thanks to the leather covered paddings. Contrary to what most manufacturers do with their earpieces, the Momentum 2.0 flaunts a racetrack oval earpads compared to the more conventional, rounded earpiece. As for the headband, it has a ventilated strip for better heat management despite prolonged use. The arms of the Momentum 2.0 can be folded and be placed in a carry pouch. Weighing only 9.2 ounces, it is considered to be one of the most lightweight headphones that you can buy in the market now. The package comes with a single cord which can be detached. The controls are placed on the right side of the headband and can be easily reached. Thanks to its incorporated NoiseGard ANC technology, the Momentum 2.0 renders a clean audio output while low-frequency noise is efficiently omitted. It is worth noting that the ANC feature can only be used on wireless mode. In terms of connectivity, the product can be connected via Bluetooth and NFC to other devices that are within 33 feet of range. The Momentum 2.0 also excels in battery life, offering up to 22 hours of use on a single charge. To provide better mic output, the Momentum 2.0 makes use of VoiceMax technology. As a result, the mic produces a crisp and rich speech recognition, especially during calls. To further omit unnecessary noise from the background, the headphones are equipped with dual built-in microphones. They help cancel background noise from both the caller and receiver. Moreover, it also has mic monitoring which lets you hear your own voice at a low volume so that you can adjust the intensity of your voice during calls. This is quite useful since noise canceling headphones tend to cut off your own voice. In terms of audio output, the Momentum 2.0 provides a rich and well-balanced output. The elements of the sounds are well balanced and not overpowering each other. Bass is loud and powerful enough but held back a little to make room for sparkling treble. More so, the audio output is set on a soundstage scenario which mimics the experience of hearing your favorite artists in an arena or an intimate setup. However, if you want to get your hands on the Sennheiser Momentum 2.0, you might need to pull up a bit more cash as it comes with a heftier price tag. Nevertheless, the Momentum 2.0 is surely one of the best headphones with mic that you can buy with your hard earned cash. While choosing a headphone is definitely not rocket science, it also pays to research and looks into features that make up for a good and reliable product. Here are the things to consider when buying a headphone with mic. The first and most important aspect you need to consider is the headphone’s audio quality. Having an accurate and crisp audio is crucial when buying a headphone. During calls, you would not want to annoy the other person for constantly asking him or her to repeat what she said. The sound output should be clear and crisp enough for you to understand what the caller is trying to relay. For audiophiles, audio quality is the most important thing they look for. Buying a headphone with subpar sound output would make no sense for an audiophile. As important as the sound you hear from the headphone is, a clear output from the microphone is also another important aspect one should not overlook. Some headphones make use of dual microphone systems as well as noise cancellation. These two features are vital additions to the improvement of the overall sound output from the microphone. With these two features, you can relay information through the mic without all the unnecessary noises and muffling. Aside from the two mentioned above, you also need to consider buying a headphone with mic with good build quality. Headphones constantly suffer from bumps and even occasional wear and tear, with this you need to buy a product that can withstand all these physical stress. There are several headphones that are built with cheap plastic material that easily breaks whenever they are used heavily. However, there are also those that can suffer all these damages inducing situations without even a hint of destruction. Extra features help enhance the overall experience with the headphone. They also help users have access to several modes or connectivity in a convenient and fast way. Some of these extra features include Bluetooth, Active Noise Cancellation, Mic Monitoring, Volume controls and several others. All these help users navigate through whatever content they are consuming or listening in a faster manner. The last but definitely one of the most important aspects you need to consider is your budget. If you are satisfied with a reliable headphone that does all the necessary features then a headphone with mic from the budget segment can suffice. However, if you want more durability and longevity, not to mention several other features from your headphone; then you might need to shell out a few more bucks to make this possible.